Nowadays with a single Android device, you can easily make phone calls or messages, listen to music songs, watch videos, surf on the internet and do many other things. Taking music as example, it is just a piece of cake to download the music songs to your phone and enjoy them whenever you want even if you are offline. And in some cases, you may need to transfer music from Android to another Android, such as saving them to an Android phone you've newly bought or sharing the beautiful lyrics to your friend or family member. So how can you easily sync music songs from Android to Android, especially when you've got a long list of music songs? 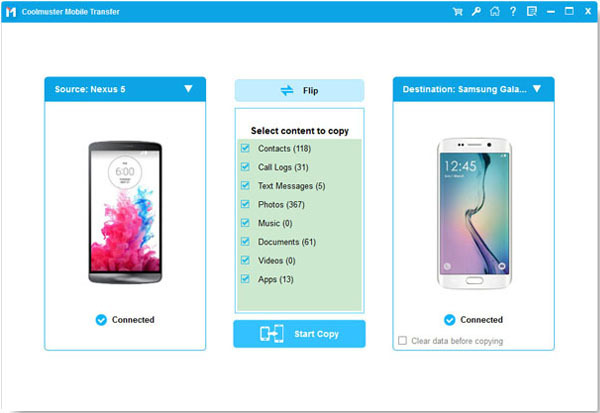 With this Coolmuster Mobile Transfer software, it is just a matter of a few clicks to transfer music from Android to Android, no matter how many music files remain to be synced. Aside from music, you can also use it to transfer other files between two Android phones, including contacts, messages, photos, videos, apps, call logs, eBooks (PDFs and ePubs). Most importantly, this software is fully compatible with all devices running Android and iOS. Below are the free trial versions of this software! You can download the right one to see whether this is the one you are looking for! First of all, open the installed software on the computer and then get your Android phones connected to the computer via two USB cords. Now, this software will detect your device and display all the file folders on the middle panel. If needed, please click "Flip" button to change the positon of the devices. Step 3. You can then choose "Music" and choose other wanted contents by ticking them out. Finally, click on the "Start Copy" button to transfer music from Android to Android. Within a little while, all the music songs will be saved from the old phone to the new one. So if want to easily transfer music from Android to Android, just rely on this Coolmuster Mobile Transfer software. 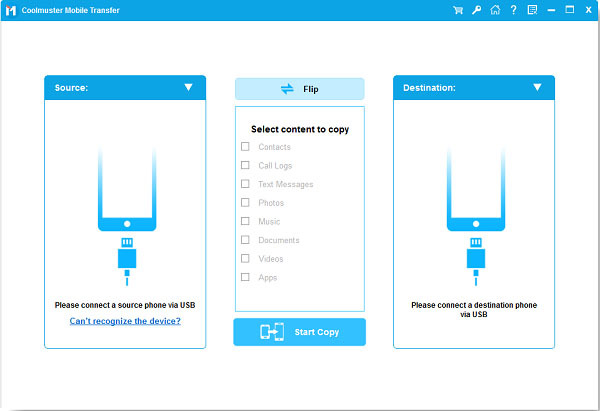 By the way, if you want to sync other files between two phones, just get this software and follow the same steps!